The Princess and The Frog, Disney's latest princess movie is to be released on 3/16/10. At our house, we love princesses! We've watched them ALL!! Gracie is very excited to watch this movie. :) I have to admit I'm kinda excited too. LOL! 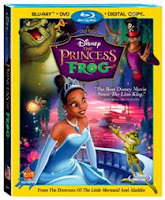 Just today I was told that I could host a giveaway for my readers so they could win their very own DVD of The Princess and The Frog! YAY!!!! So happy!! To enter just leave me a comment below telling me what Disney Princess is your favorite. That's it - you're entered!! For additional entries you can do the following and leave a comment for each. Here we love Belle. We are looking forward to seeing the movie "The Princess and The Frog". We did not have a chance to see it in theaters. You are on my Google reader. Definitely Snow White!! I'd love to win this for the girls! Ariel is my favorite princess. I now follow your blog via Google Friend Connect. Cinderella is my favorite Disney princess. I'm subscribed to receive email updates. Cinderalla is my favorite princess. Even though I have two boys, I really think they would enjoy this movie. Jonathan loves frogs anyhow! haha..
Do I have to leave seperate comments for the other entries??? Our favorite Disney Princess is Belle from Beauty and the Beast. She has such a kindred spirit and I personally love her passion for reading. Ariel is the one we love at our home. My favorite Princess has always been Cinderella! My girls really like Ariel and Aurora. My girls have been really wanting this movie too!